I’m a little late here. Okay, very late. The Half Moon Restaurant and Saloon closed in March. After only two visits, it became a favorite when out in Pennsylvania. It also holds distinction as being one of just a handful of restaurants to have more than one post devoted to it. This will be number three. The Half Moon specialized in “exotic” meats. The menu offered sandwiches and entrees featuring elk, bison, buffalo, venison, and even camel (among others). But there were plenty of normal meals too. They also had a great bar which churned out quality specialty cocktails. The atmosphere was wonderful, whether inside the old building or out on the rooftop atrium. My first meal there was a pulled elk sandwich. The meat itself was slow-cooked for 13 hours before being piled high on ciabatta with broccoli rabe and provolone cheese. The second time out called for more elk, this time in the form of a steak. The go-to appetizer was the crab nachos which were out of this world. Half Moon was also one of the only places to keep Crispin Cider (blackberry pear in particular) on hand. Then there was the “Old Buffalo” whiskey cocktail I nabbed on my second time that was like their version of a Manhattan. All prices were more than adequate. Browsing through Instagram posts tagged and checked in at Half Moon in the waning days of their existence show just how beloved this restaurant was to the community. Several customers boasted going their for the entire two-decade run while even some former employees chimed in to say how they enjoyed working there. 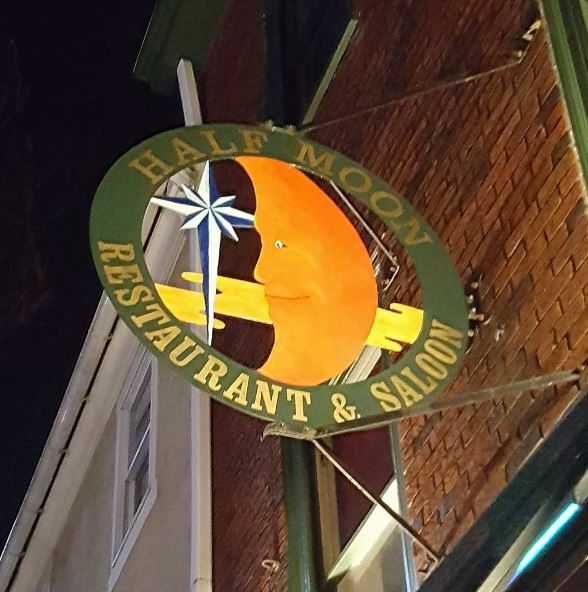 The Half Moon Restaurant and Saloon in Kennett Square was a favorite of Eating New Jersey and will be missed. Cheers to the Half Moon’s 20 year run!